Three hundred years in the future and the world is a vastly different place with humanity fighting a seemingly endless war against an implacable alien enemy. The planet is in constant danger from alien infiltrators and religious hackers while orbital elevators allow easy access to space, a huge convoying nation of Nomads means tracking people down can be almost impossible. Jakob Douglas is an ex special forces cyborg, more machine than man and he's having a bad day; not only has he been reactivated by his old C.O. to track down an alien killing machine that is just like the one that killed his whole squad - but this machine is now lurking down the back-streets of his own hometown. The world of Veteran is a dark, gritty and dangerous place, the long and draining war taking it's toll on the population of earth both with an extreme form of social segregation and bio-mechanical alteration for many who fight or have fought against Them. 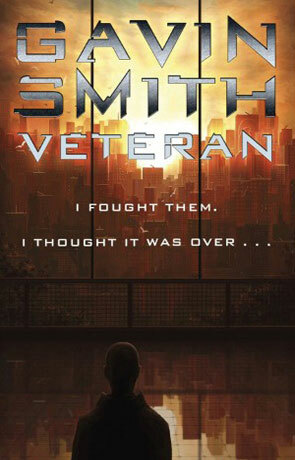 Smith paints a view of a very harsh and piratical future earth, narrated in the first person from the view of this burned out super soldier cyborg. The (minimal) back story is mainly built up using exposition and the occasional flashback of the character in war against Them which works well for the most part and doesn't drag the pace down that noticeably. I loved the use of the various real world areas which really helps to ground the story, even if those places are barely recognisable in this bleak future. Against this dark and rather stylish background we a hectic plot that sends the protagonists across the world, to the bottom of the sea and out into space via some descriptive, brilliantly choreographed and diverse fights against some very memorable opponents. I do feel that the Grey Lady is underused though, she is always in the background as a pervasive threat but I feel a few more appearances would have heightened the tension. The actual plot is fairly straight forward and mainly entails the protagonist traveling to point A, getting beaten up, going to point B - getting beaten up and so one and for many stories this wouldn't work however due to the sheer uncompromising and unsubtle quality of the writing and more importantly the rich characterisation it does work here incredibly well. If you've ever read any Richard Morgan you will be in familiar territory, only this feels darker, grittier, louder and more grounded than Morgan's work - in some ways the places feel more identifiable but that could just be that I have knowledge and experience of the British locations used. The characterisation really steals the show, each of protagonists are brought to life in a such an effortless manner and grow in personality as the novel progresses. The other aspect I found mesmerising is the portrayal of the cyborg, the descriptive use the first person narrative gives a rare glimpse of the bio-mechanical marvel - the synergy between man and machine is realised here more effectively than anywhere else I have read. The book does manage to avoid falling into that trap of techno-babble or hard scifi and this means the dialog comes across as neat and quite snappy. There are some fantastic ideas used here too, some parts of the novel feel almost post-cyberpunk and the whole concept of the future internet is quite eye opening and retrospective. I have no hesitation in recommending Veteran, I really couldn't put it down and the novel has left a lasting impression that will not fade for some time. Written on 29th May 2011 by Ant.